Please give a written response to the five criteria below and submit with contact information form. Dental services using the equipment must be provided by certified practitioners of dentistry. Dental services using the equipment must be provided to patients who would otherwise have no access to dental services. It must be shown that dental services using the equipment will be provided on an ongoing basis; that is, equipment “downtime” must be minimal. Dental services using the equipment cannot be performed for profit either to the organization sponsoring the services, or the dentists providing the services. Fees can be charged only to cover basic costs for operations. Dental services, using the equipment, must be provided by civilian organizations and dentists to civilian populations only. 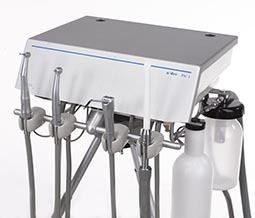 Although there may be no control of equipment usage after shipped, the purpose of the above requirements is to REDUCE THE PROBABILITY of providing low-cost dental units to organizations attempting to circumvent a local dental dealer or to use the equipment for any purpose other than providing dentistry to those who may otherwise not have it available to them. Newberg Rotary Club, and A-dec, Inc perform thorough reviews of requests to prevent for-profit dental services from using dental equipment associated with this program. Mission Dental/Rota-Dent is a not-for-profit a World Community Service Program of the Newberg, Oregon and Salzburg, Austria Rotary Clubs.